One recipes in the book, Date Cake, looks like a last minute additional. It is written around other recipe which had been pasted into the book—and it says that is a recipe of Ruth’s. Did Ruth make Date Cake while Aunt Marian was living with her? . . . . and did Aunt Marian love it and insert it into her cookbook? The many food spatters and stains clearly indicate that at least one of the recipes on this page was a favorite of Aunt Marian’s. I’m guessing it was the Date Cake—though I haven’t yet made the California Upside Down Fruit Cake, so I could be wrong. Preheat oven to 350° F. Stir baking soda into the water and pour over the dates. In another bowl combine the sugar, eggs, and butter; then add the date mixture and stir. Add flour and stir until all ingredients are combined into a batter. Stir the walnuts into the batter. Put into a loaf pan that has been greased and floured. Bake for 50 to 60 minutes, or until a toothpick inserted in the cake comes out clean. 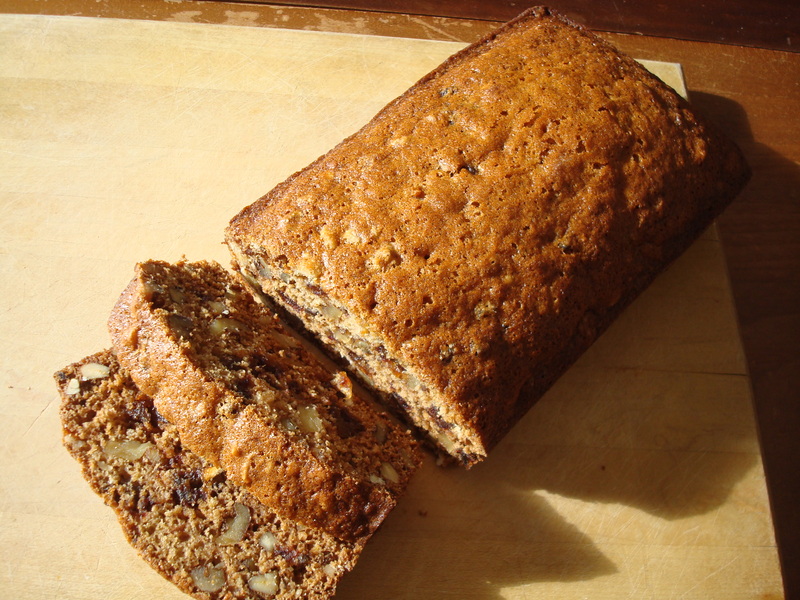 This recipe is super easy to make and delicious—though I would consider it to be more of a date nut bread than a cake. It is definitely a keeper, and I feel certain that I’ll make it often. 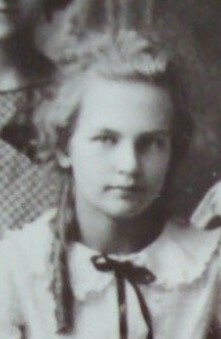 Photo of Ruth—She was Aunt Marian’s youngest sister. This photo was taken 15 or 20 years before Aunt Marian enlisted in the WACs. Butter a slice and enjoy it with a nice cup of tea! It’s identical to a recipe my mum used to make may years ago. mmm. . .. it sounds so nice and relaxing to eat it with a cup of tea. It does look good, and you know those recipes that are added to a cookbook that way, or well-splattered, were favorites. It reminded me of a date-nut roll my mother used to make. I can’t quite remember what it was. I know it had nuts, dates and marshmallows. It was rolled in waxed paper, refrigerated and then sliced. I think it might have been more of a candy. I need to see if I can find that recipe. Your mother’s recipe sounds really good, too. So many of these old recipes are so tasty. And, thank you telling about the recipe shortcut. Until you told me about it, I never knew that this wonderful WordPress feature existed. I wonder if they called it a cake because it could also be baked in a cake pan? Maybe. . . When I made it, I mixed up the batter, and then decided that it was about the right amount to work well in a loaf pan, but it probably would have worked equally well in a square cake pan. My grandmother used to make a square date cake so your post made me think of that cake. It sounds great. Must have been a real favorite! The recipe makes it look like it definitely was a favorite. They sound really good, too. Sometimes I’ll have to try mixing up this recipe and then putting the batter in muffin tins. This looks so good and so does the other recipe beside it. Such fun to see inside her cookbook. I really enjoy looking at her cookbook. You can tell so much about what she was like from the recipes, the names of the people she got them from, etc. My mom made date nut bread, and there was another that had the filling rolled or swirled. They were both delicious. I really enjoy looking at old cookbooks. They contain so many clues about the owner, favorite recipes, etc. I agree! I also really enjoy old cookbooks that were compiled by churches and community groups. People generally tried to share their best recipes. I do enjoy trying old recipes. I often tend to select ones that sound like foods I’d enjoy. Sometimes I think that I should also try some of the ones that sound less interesting to me. I might discover some awesome new foods. I agree! There’s something very personal about recipe books. I love how you’re including recipes along with your aunt’s letters! I’d be tempted to borrow the idea, but the only thing my grandpa ever made were potato pancakes (which were delicious, but I don’t have an exact recipe as it’s the kind of thing you have to eyeball). I do have a box full of my grandma’s handwritten recipes though, which I love looking through! It’s nice to hear that you enjoy the recipes. More will be coming in future posts. I like how people knew how to “eyeball” batters and other mixtures in the old days, and then would adjust ingredients as needed. I think that something has been lost over the years. 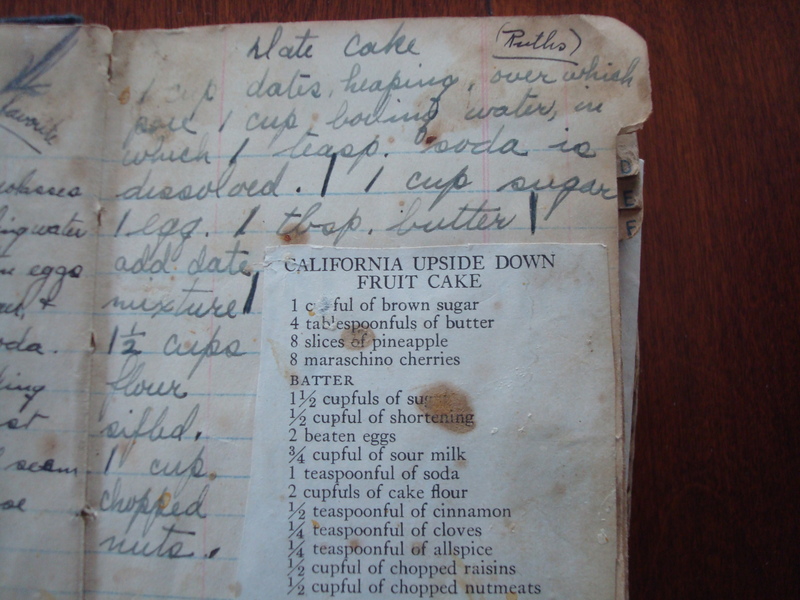 You are fortunate to have your grandmother’s handwritten recipes. Both recipes look delicious. If a page is splattered it’s a sure sign of a good recipe!